Snow Melting Systems: Where do you Start? Purchasing a snow melting system like the ClearZone system offered at Warmzone is a great way to eliminate manual labor and make your home or business safer, but the process of finding, purchasing, and installing a system can seem complicated to any buyer. There are quite a few questions that can slow the purchasing and installation process. What products best suit my needs? How much power is required? How is my system installed? Here is a quick breakdown of the procedure to help you make a confident and informed decision. One of the first things that needs to be addressed when installing a snow melting system is to determine the square footage of the area to be heated. A rough draft of the area you wish to heat is typically needed to begin the estimate and design of your radiant heat system. If you are unsure of the exact measurements or don’t know how to calculate the square footage of your driveway or area to be heated, contact Warmzone at 888.488.9276. With state-of-the-art software that allows for a satellite view of the property, a qualified Warmzone representative can measure the square footage for your project over the phone. Warmzone also offers professional design services to provide you with a detailed layout of your system. The custom layout takes all factors into consideration, including, the specifics of your property, the climate of your location, average yearly snowfall, and power requirements. Designing a custom system for you ensures that the best solution is provided and makes the installation of the heated driveway you’ve been imagining easy and painless. 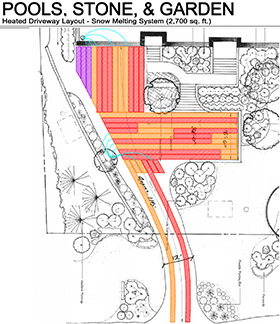 Example of radiant heated driveway system AutoCAD. When it comes to power for your radiant heat system, here are few basic guidelines. It is important to verify the existing voltage (110/120 or 220/240) and available amperage. To make certain of your home’s power, we recommend having an electrician come to your location to measure the amperage. However, you can also check your home’s power by accessing your main breaker panel. Most homes are equipped with either two 100 amp panels or one 200 amp panel, which should be located at the top of the main breaker box. When figuring out what power your system may need, consider that one 30 amp breaker will heat about 170 square feet, so a 350-square-foot driveway would require one 60 amp breaker, or two 30 amp breakers. But don’t be intimidated by these details. Warmzone radiant heat experts will assist your electrician at any time to help ensure that all of your project information is correct prior to any installation taking place. 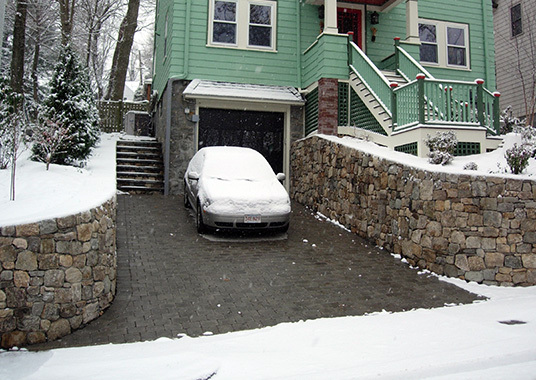 Most homes have more than ample power to operate a heated driveway or sidewalk(s). However, in the unlikely situation that there is limited power available, a technique called zoning can be used. Zoning allows those with minimal power to still enjoy the benefits of a snow melting system. Your designated snow melting area is divided into zones, each with its own snow sensor. The zones are prioritized by which area must be cleared. Each zone operates separately, utilizing the available power to remove snow and ice from the designated area. This allows the system to optimize the available power. After the first zone is cleared power is sent to the next zone and so on, cycling much like a sprinkler system. 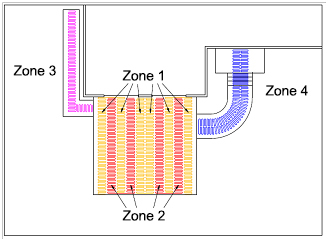 When faced with a limited power supply, snow melting systems can be installed to heat by zones, shown in this illustration. At Warmzone, zoning is efficient and cost effective. The smart cycling features allow an area that may already be cleared to be skipped and not activated. Homeowners can also operate the system manually. If you have any questions about power, a Warmzone representative would be happy to assist you and explain your options. To talk with a radiant heat expert, call 888.488.9276. After verifying the voltage and available amperage of your home or business, you can move forward with the installation. Snow melting systems can be installed in almost any medium, whether it’s asphalt, concrete, or pavers. After choosing and receiving your heating cable and other system components, it’s time to prepare the area for installation. Make sure the area is cleared of any rocks or debris that may damage the heating cable. With concrete installations, a wire remesh is installed and the heating cable is secured to the mesh to ensure proper cable spacing and prevent shifting during pouring. Next, Mesh-Up plastic supports are installed to prevent the cable from sitting on the ground. Finally, an aerial mount snow sensor is installed, which activates when there is precipitation and temperature drops below the set point (usually 39°F). When installing system components make sure to follow building codes and advised installation methods. You can also check out some basic installation tips here or view some helpful installation videos. Still have questions about snow melting systems? Take advantage of the many industry leading services available at Warmzone. Professional design and engineering services offered at Warmzone provide customers with product consultation as well as a detailed CAD of their system’s layout. This ensures system performance expectations are met and minimizes installation issues. Free Installation training through Warmzone University is offered online or in person, and free tech support from radiant heat experts and electricians is also available. Check out all the benefits Warmzone can offer by contacting a dedicated professional today at 888.488.9276. Radiant heat systems work. It’s a proven technology that produces impressive results. But like most technology related products, if a radiant heat system isn’t installed correctly, the results can be equally disappointing. Installing a radiant heat system is not difficult, but it does need to be done properly. You can buy the best snow melting system components on the market, but unless they’re installed correctly, you won’t see the results you’re expecting. Recently named “Vendor of the Year” by the National Association of Custom Home Builders, Warmzone is a proven and trusted industry-leading provider of radiant heated driveways, heated floors and roof deicing systems. The company achieved its position by not only offering superior products, but by including the industry’s most comprehensive customer support services, including free installation training, technical support, and system design. These unparalleled services distinguish Warmzone from the competition, and have set the gold standard for all radiant heat providers. IMPROPER CABLE SPACING. Too often, installers neglect to follow the cable spacing rules: Keep the cable at a minimum spacing of 2 inches and a maximum of 4 inches (center-to-center). Make sure the cable in adjacent mats is at least 2 inches apart. IMPROPER CABLE DEPTH. In concrete applications, many times installers allow the heat cable to rest on the dirt prior to the concrete pour. (Invest in Mesh-Ups. These plastic support ‘chairs’ are extremely affordable, and they can make all the difference in the world between a successful and an unsuccessful installation.) Mesh-Ups elevate the re-mesh (and heat cable) so that it is not resting on the ground when the concrete is poured. It’s a simple, affordable solution to prevent poor snow melting system performance, not to mention unhappy customers. NEGLECTED WARRANTY CARD. Too many installers forget to fill out the warranty card and mail it to the manufacturer. Don’t let this happen. FORGETTING TO TEST THE CABLE. Too many installers forget to test the cable during all phases of the installation. Start by testing the cable out of the box and then throughout the installation. COMPROMISED HEAT CABLE. Maintain the cable integrity by never cutting the cable, and take extreme caution when using shovels and rakes during concrete pours. Before buying and installing a radiant heat system, review the checklist below. Verify the correct voltage of your home or business (220/240 or 110/120). Verify the available amperage. Don’t guess or assume. You’ll need to be certain, so we recommend having an electrician come to your location to measure the amperage. Do your homework before hiring an electrician. Let’s face it, not everyone is competent or ethical. Preferably, find one who has been in business for several years. Ask around and talk with those who have personal experience with electricians. Keep in mind that the National Electric Code (NEC) requires that the system has 30mA GFEP (30mA trip protection). Make sure the installer has completed Warmzone’s free installation training course. After installing your radiant heat system, fill out and mail your warranty card. Perhaps the most overlooked tip – and one that can eliminate installation mistakes and unhappy customers – is to take advantage of the free training! Call 801.948.7577 or 888.488.9276 to sign up or learn more. Installation #1: DON’T CUT THE CORD! “Instead of starting the cable installation as close as possible to the electrical source, one installer began running the cable from the terminated end. After laying out the cable, he discovered that he had about 60 extra feet of heat cable – including the splice to the cold lead. He cut the excess cable and then ran the heat cable (from the terminated end) directly into the ETO2 control unit! Never cut the heat cable! To make turns, cut the white binding tape and arrange the cable accordingly. “Many installation problems are a result of improper spacing of the heat cable. And while mats come with the cable pre-spaced, the adjacent mats still must be spaced no less than 2 inches apart. The photo below shows how one installer laid out the cable and then applied the concrete pour. Instead of cutting the white binding tape to make turns with the mats, the cable was simply ‘serpentined’ all across the driveway; overlapping and bunching up and so on. Example of incorrectly laid out heat cable for heated driveway. Cable must not touch or overlap. Always follow the installation guidelines regarding the correct layout of the heat cable. 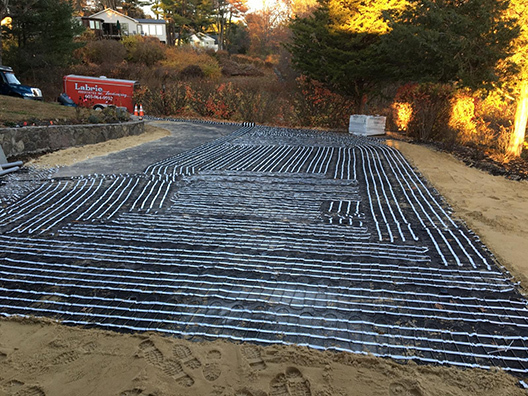 Example of heat cable (in mats) laid out correctly for a heated paver driveway. Test the heat cable during the installation and record the readings in the fields provided on the warranty card. After installing your radiant heat system, complete and mail your warranty card. Perhaps the tip that can most effectively eliminate installation mistakes and unhappy customers is this: Take advantage of the free training!